How is your weekend going? Are you set for Christmas? What are your plans for Christmas? I'm in the mood to celebrate the birth of Jesus and to share gifts with others. To my readers and followers, are you having problems commenting on the blog? A lot of people have reported to me that, the comment section of the blog is not working. I really don't know what's going on. If you continue to have problems with posting a comment, please contact me on trulymakingadifference@gmail.com and I will get the team to look into it. It's all about "Before I Do" -- A Christian radio show. The show is 'buzzing' in London. It's a must to listen to this show as a Youth leader, as a single person, and as a mentor to Christian singles. Have I also mentioned that the show is extremely informative? In addition, experienced guest speakers (both Christian singles and married guests) are invited to the show. The Executive Producer is doing a great job, he goes out of his way to ensure that relevant topics that are facing Christian singles in this dispensation are discussed on the show, and he has continued to ensure the he invites experienced guest speakers to be part of the show. I can still recollect when the Producer told me about the vision that God gave him to start a Christian radio show, fast forward to a month after that he'd informed me, the vision became a reality. Please, read more about the radio show below and remember to tune in every Monday at 7pm. You just need to download 'Hephzibah radio' app on your phone/laptop/tablet/computer. “BEFORE I DO” RADIO TALK SHOW INTRODUCTION! 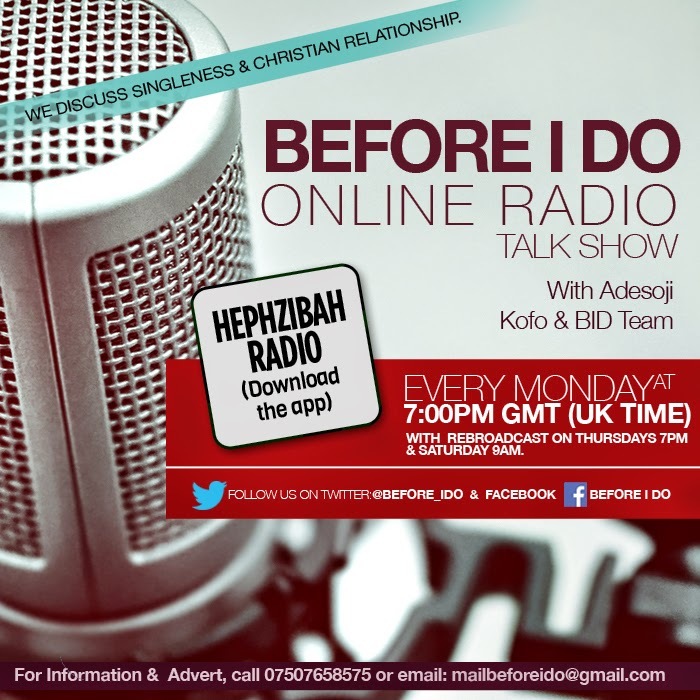 "BEFORE I DO",-BID an online Radio Talk Show, is a God-inspired programme which focuses on singleness and relationships for single Christians, and seeks ways to help them become better individuals and marriage partners. It is a project founded to help single individuals understand God's plan for this phase, as well as God's expectations from them as they prepare for marriage. 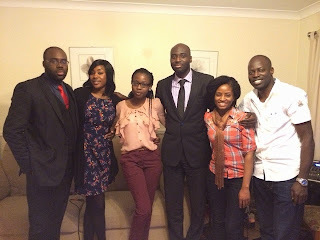 The Radio Talk Show started broadcasting on the 13th of February 2014 and has since been airing weekly till date. BID, a magazine styled interactive radio talk show hosts men and women of God who are highly graced in the relationship and marriage-counselling field, regularly. Our listeners, who are from different continents in the world are always given the opportunity to call-in on the show, which gives them the opportunity to contribute via live phone call. Going by the great feedback we receive weekly, we can confidently say that our over 1,000 listeners worldwide are being blessed. BID airs every Monday 7pm on Hephzibah Radio with a Rebroadcast on Thursdays 7pm – 9pm and also on Saturday 9am. You can tune in by downloading Hephzibah Radio App on your smart phone or download Tunein Radio App on your smart phone, iPads, BlackBerry & Android devices, and then search for Hephzibah Radio. We encourage you to listen in weekly and be blessed. Do me a favour this week, tell a friend to tell another friend about Before I Do radio show. We need to ensure that singles are taught the truth about Christian relationships.